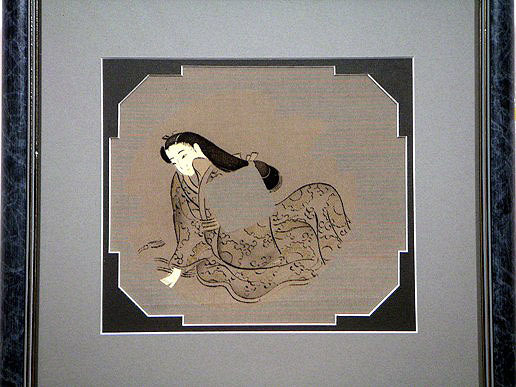 These lovely hand painted Courtesans are reminiscent of the Heian Era in Japanese History. This is a typical genre scene in that it reveals the hidden everyday lives of these idealized women at leisure. If you look closely, you will notice that their features are flat and highly stylized. 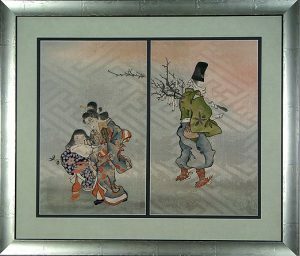 The hand painting has been accomplished through the “rice paste resist” process, and not from dip dying, which is a highly labor intensive method of painting on silk. 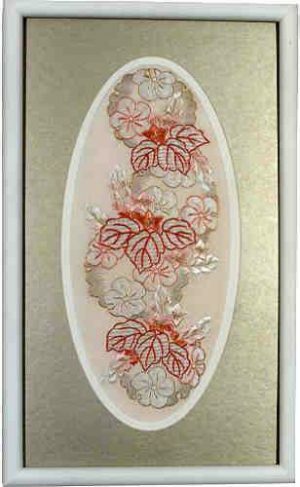 This process requires a tedious series of painting with the rice paste the areas that are to be painted in later with each of the various colors. The colors used were from natural dyes. This alone would indicate that this silk fragment came from the garment of a wealthy man of high status. Additional evidence, however, lies in the nature of the hand woven background silk. 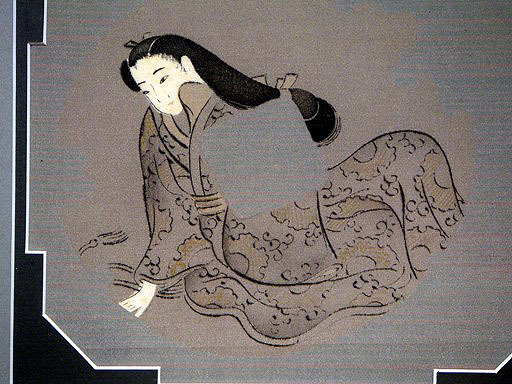 It is very fine and painstakingly demonstrates the subtlety of Japanese patterning in the delicacy of its very neutral, yet masculine, stripes. Hand woven Silk that has been hand painted in excellent condition. 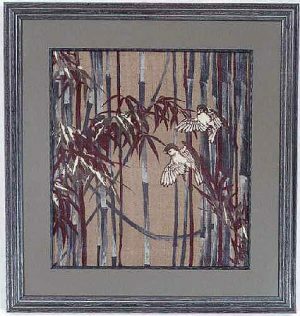 These charming Silk Fragments have been matted with acid-free mats of dark charcoal and gray in a style reminiscent of Japan and referred to as a “Kobe” corner. 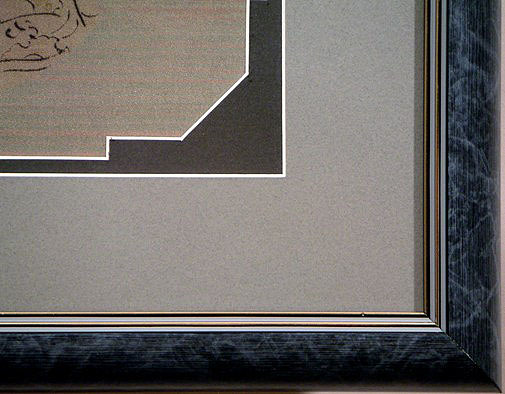 They have been placed in a dark mottled gray wood frame highlighted with inner stripes of silver and gold. It is protected by non glare, 97% UV glass. They have been mounted in conformance with the highest standards in order to ensure a damage-free environment for their future protection.